Yes! It can be done!! 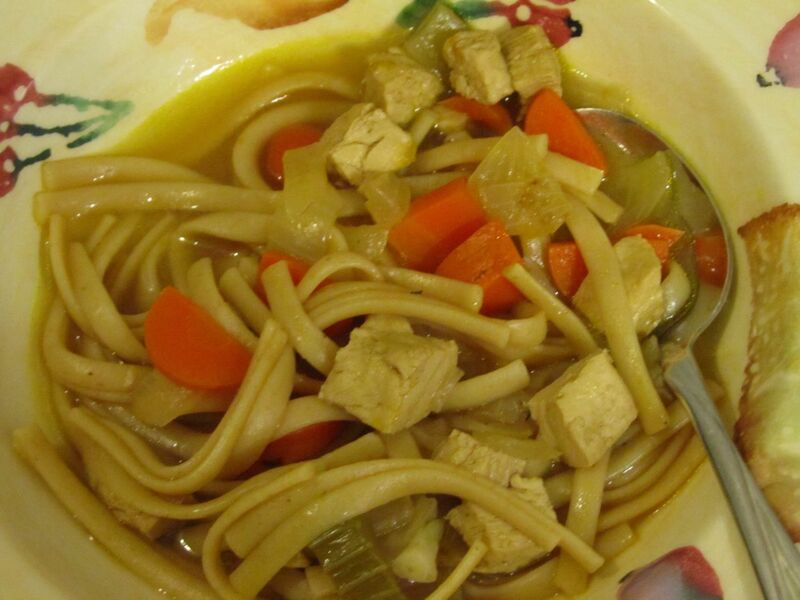 It is entirely possible to make tasty vegan chicken noodle soup! 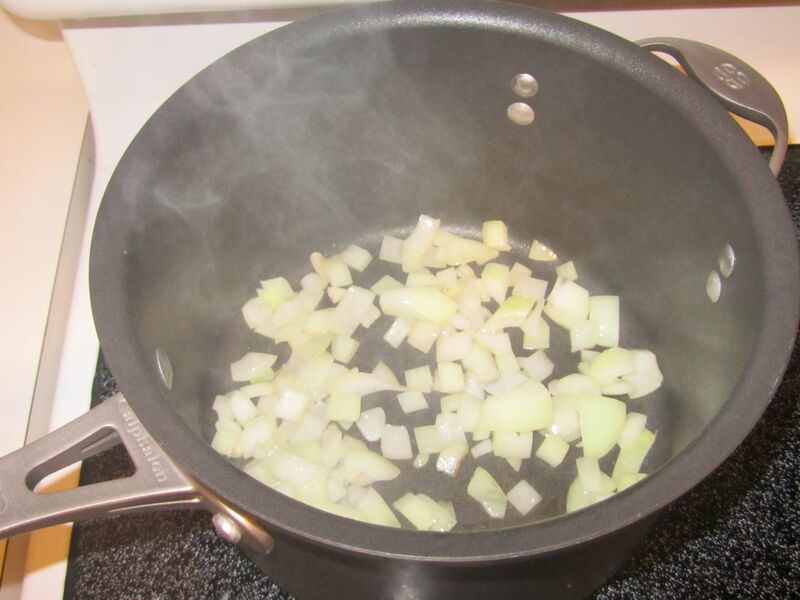 Cook the onion and Smart Balance butter for 5 minutes on medium heat. The onion should soften. 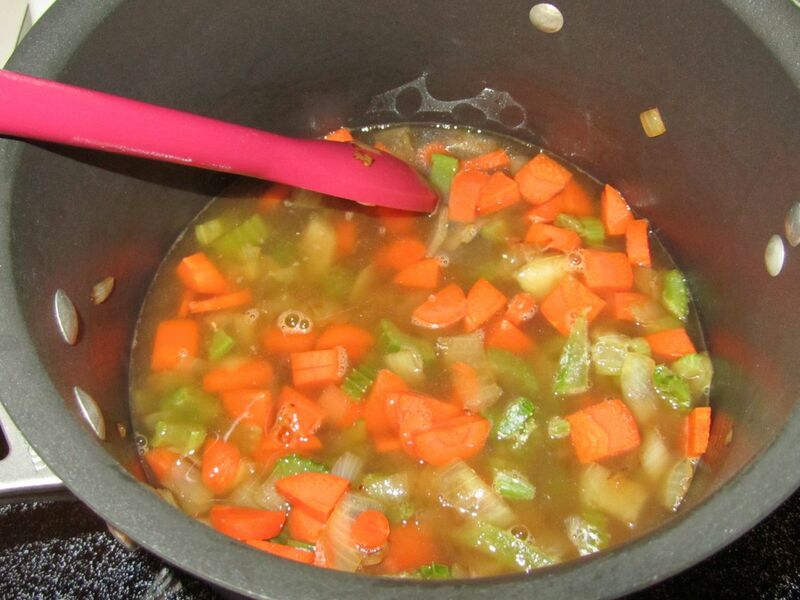 Add the carrots, celery, and enough broth to cover. 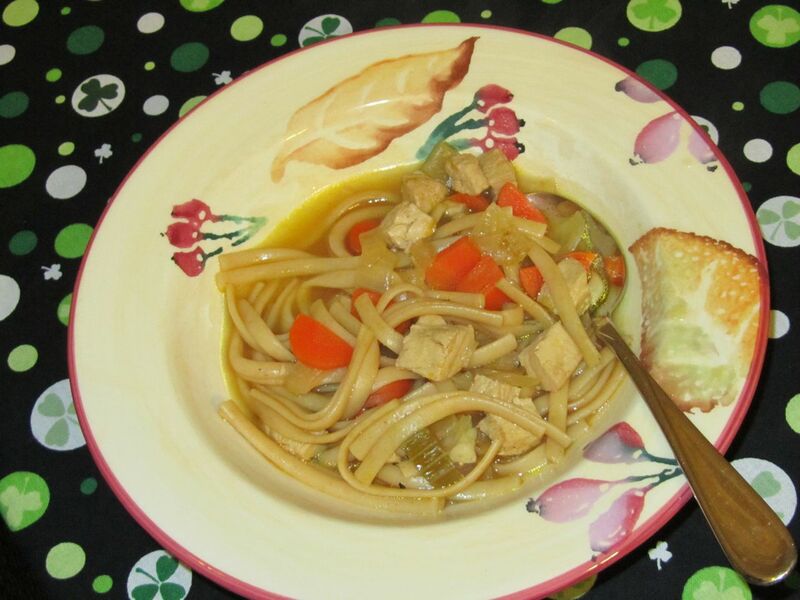 I keep celery chopped in the freezer, and I added it in frozen. 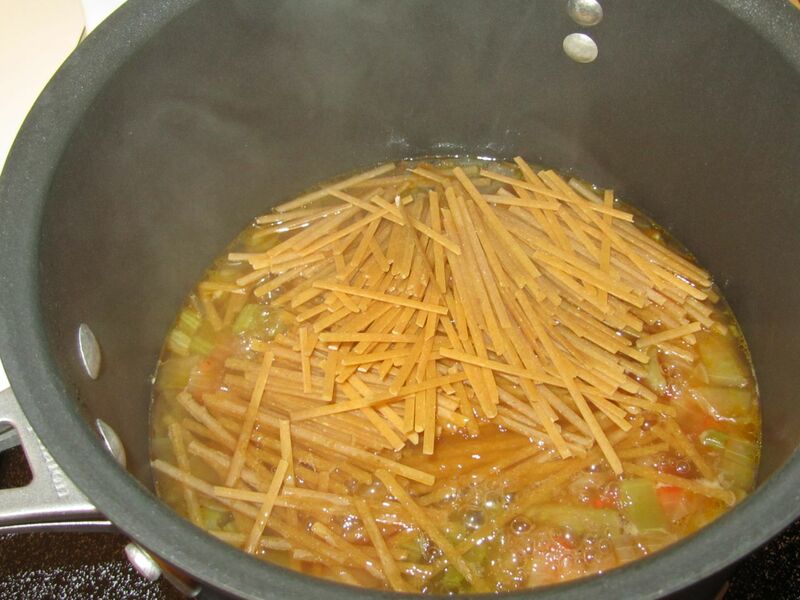 Bring to a boil, cover, and simmer for 15 min. 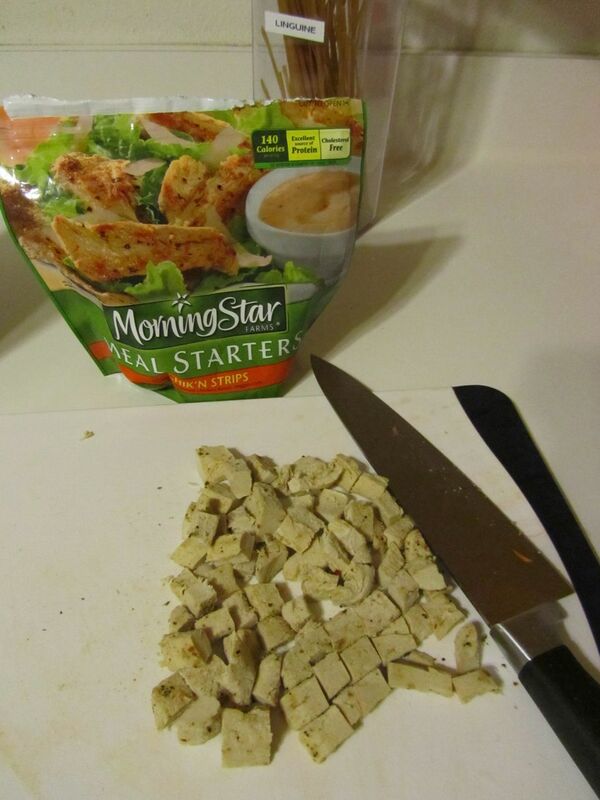 These are the vegan chicken strips, chopped. I didn’t warm them up or defrost them. I just let them sit on the counter while I cooked the veggies. 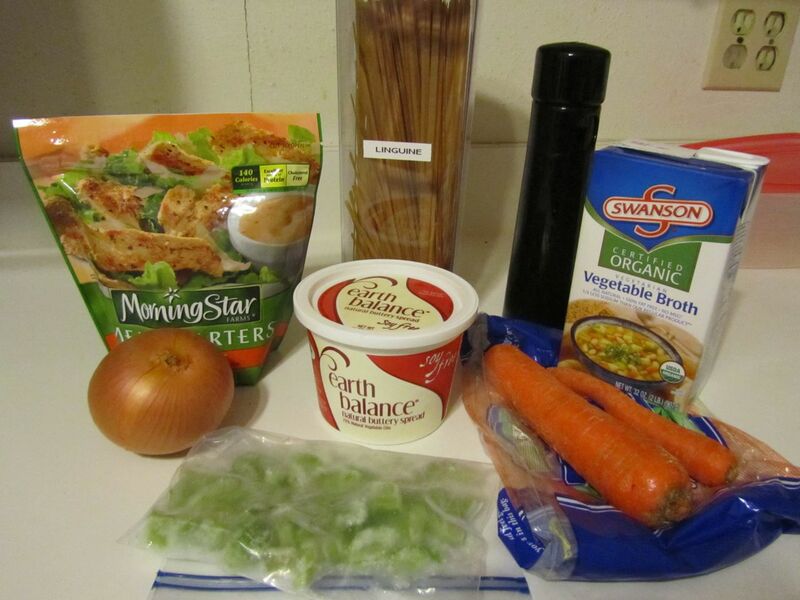 Add the linguine (break it up into 2-3 in. lengths if you like), the chicken, pepper (to taste), and the remainder of the broth. Bring to a boil, cover, and simmer for 25-30 min. 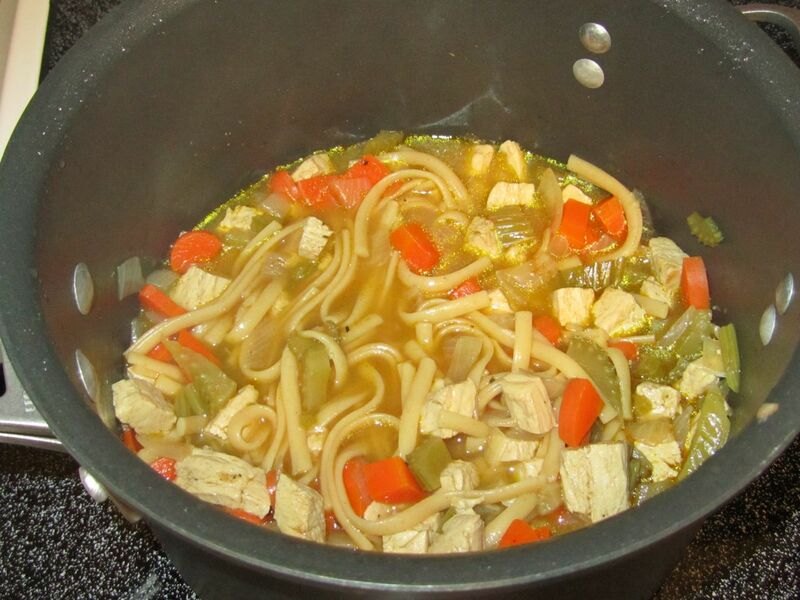 This is right after I added the pasta, chicken, pepper, and broth. Finished! 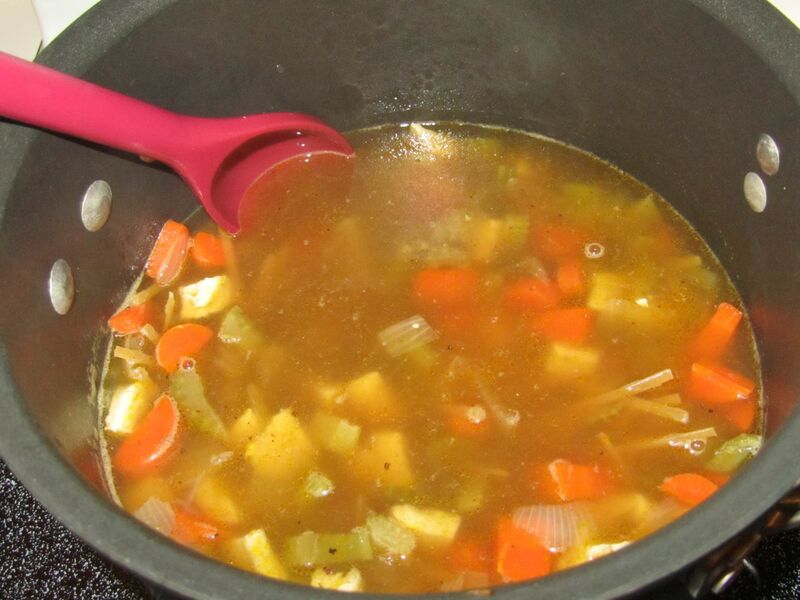 You can see how the broth reduced. 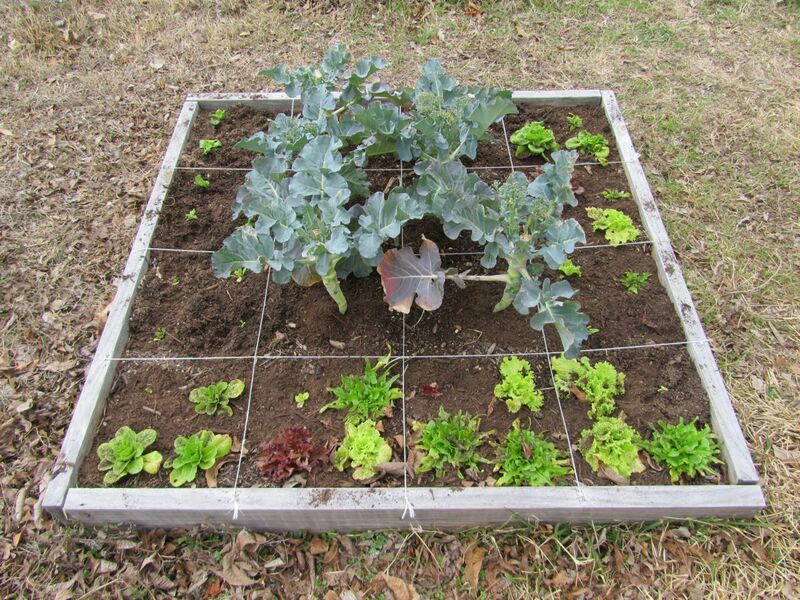 After reading Seeds of Self-Reliance in the March Ensign (Church magazine), which encourages people to grow plants, be it in containers on patios or on window sills, in gardens, in community gardens, on roof tops, etc., I was inspired to get my garden back in shape. I’m on a 3-day weekend, so today was perfect. We recently had several freezes. Most of my garden made it through. 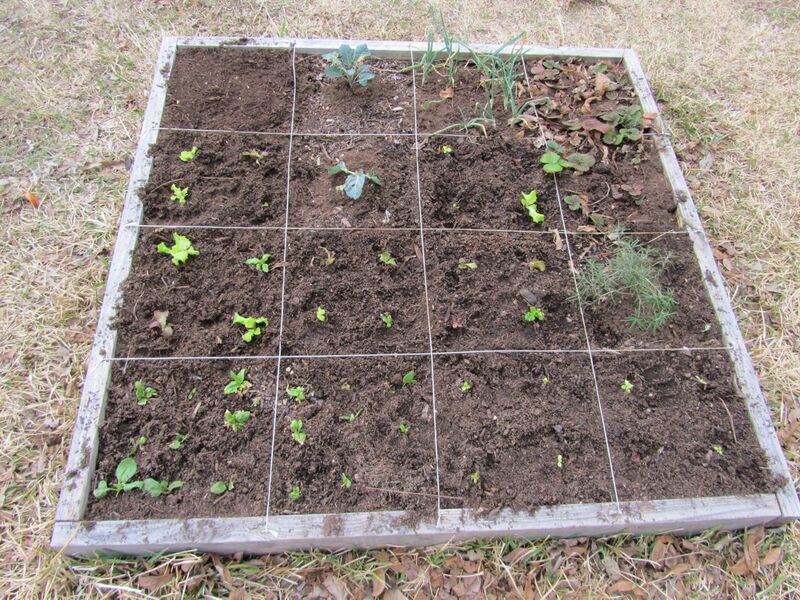 After I had harvested my potatoes in the fall, I had planted more lettuce in the squares (I use Square Foot garden boxes that I divide into square grids). Those needed to be moved so that I could plant more potatoes. I also had empty spots here and there where plants had been harvested or killed by cold weather (such as my tomato and basil plants). I went for a mostly pink and red color scheme. In this box, we have broccoli and various types of lettuce. The lettuce has been growing very close to the ground, probably due to the cold weather. 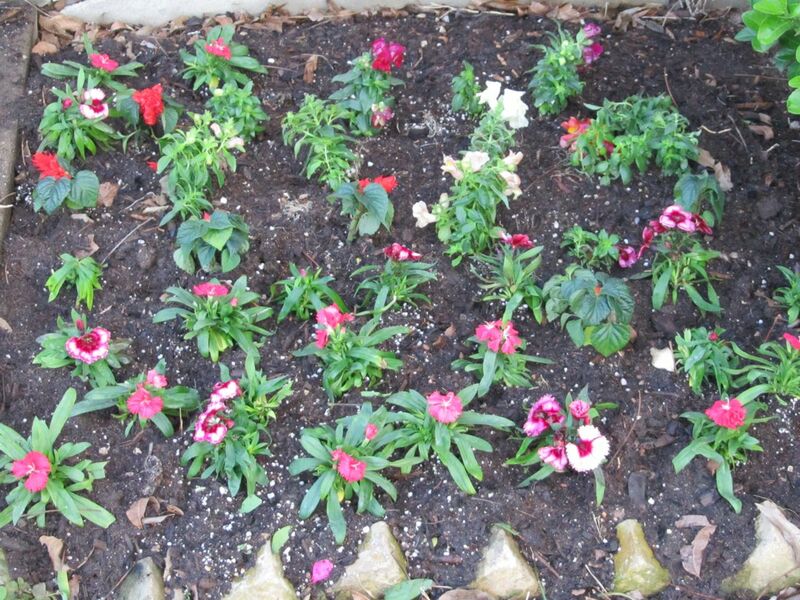 Now that it’s warm again (70’s and 80’s in the afternoons), I’m hoping it will grow. If you look closely, you can also see the smaller lettuce plants that I moved from one of the other boxes. The smaller ones were planted when I harvested the Fall potato crop. This box has more lettuce, multiplying onions, 1 kale plant, spinach, 1 collard green plant, strawberries, and rosemary. I also planted one square of sugar snap peas. 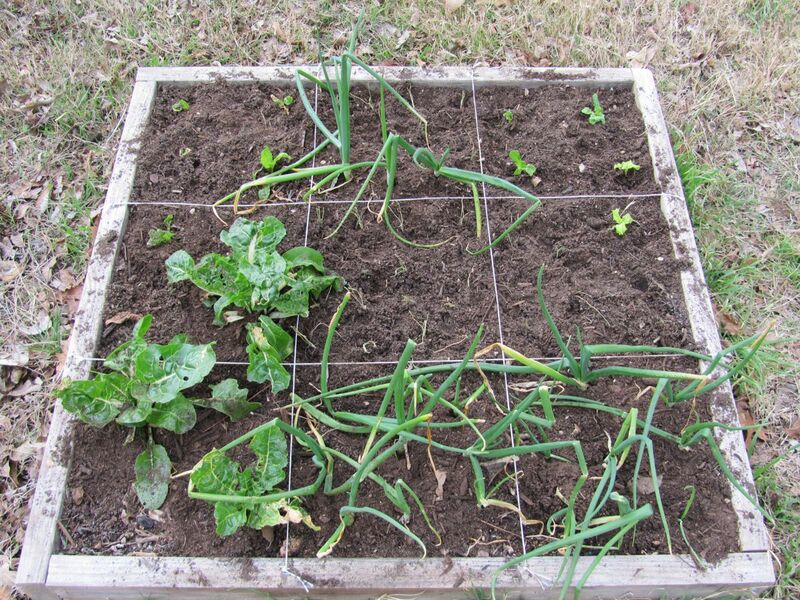 This box has some very successful swiss chard, several onion plants that should be ready in April, a few lettuce plants, and several tiny onion plants of unknown type, which were dropped off by some very kind neighbors who also garden. We tend to give each other extra of what we have. I plan to share some extra seed potatoes with them. Sorry, this one is blurry. This box is where I planted the potatoes. This time, I stuck an entire seed potato (a potato that has eyes that really grew) in each square. As the potato plants grow out of the soil, I plan to add more compost on top for a while, in the hopes that I will get a higher yield of potatoes. The green plants in the picture are leeks. They aren’t as wide in diameter as the ones I’ve seen in the store, so I’m going to let them grow a little longer. 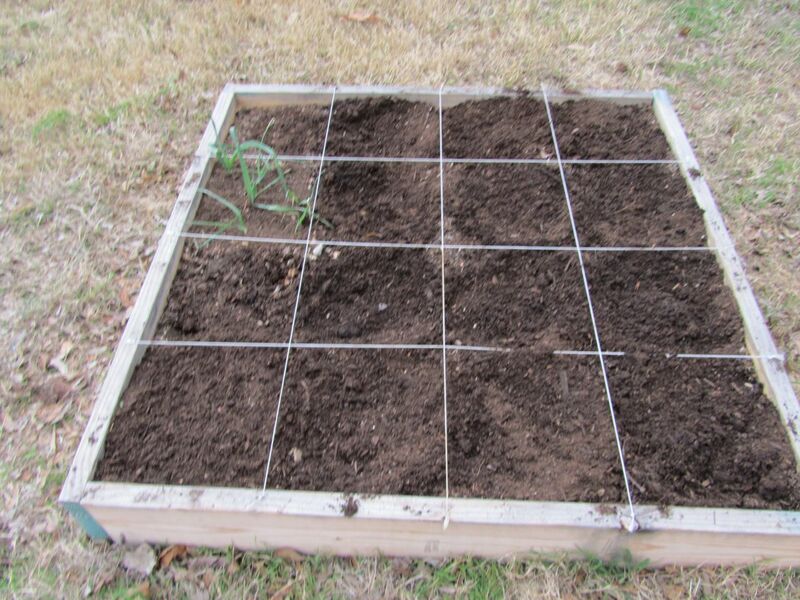 I planted one square of carrots and plan to plant another square in 2 weeks. I’m really looking forward to planting cucumbers, tomatoes, and bell peppers at the end of March. I figure that I’ll have more spots available by then, as some of my winter plants will be harvested. I have a double compost bin that is easy to access from my kitchen. It’s not so easy to get to with garden scraps. I decided to build a second compost bin closer to my garden boxes. 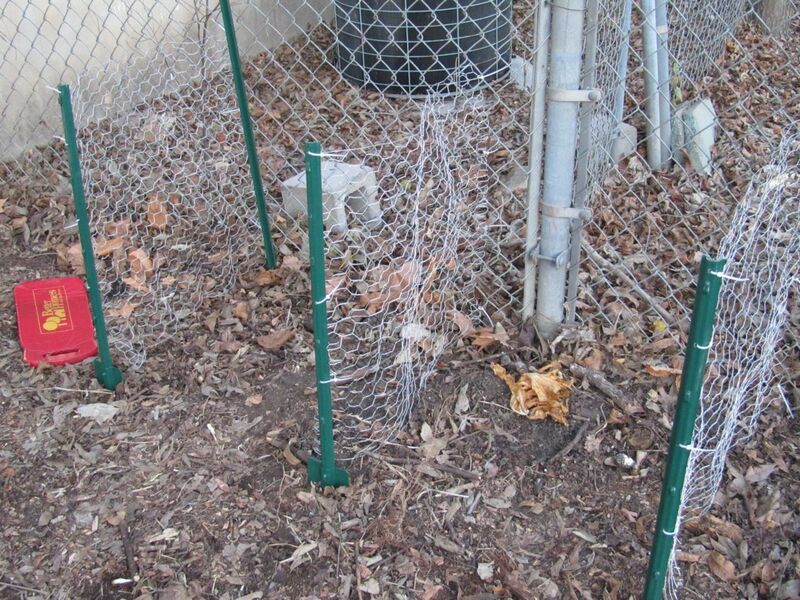 I used fence posts and poultry wire. A hammer worked well to pound the fence posts into the ground. To connect the posts and wire, I used plastic cable ties. The bins are 2 ft tall. Each bin is about 2 ft by 2 ft in area. I used the fence as a backing. 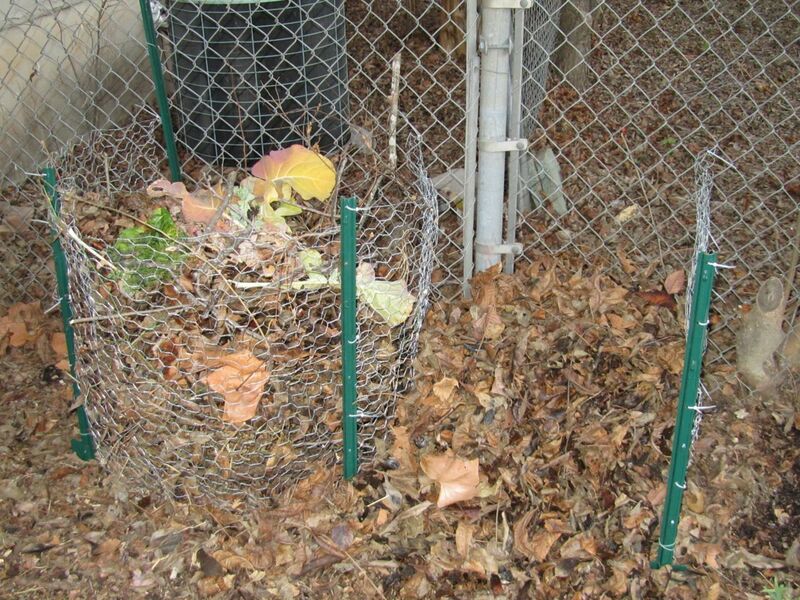 Here is a picture of the bins with leaves and compost in them. The poultry wire roll I bought was 10 ft long. After framing the sides of the bins, there was enough left over to put a front on one of the bins. I attached the front with loose wire so that it can be easily removed for turning. The bin on the right will probably get a front once I find some wood or poultry wire that fits. It’s very nice to have a compost bin so close to my garden. Now, I can walk right over with any weeds, dead plants, etc. I really like the double bin, because once one side is full, you can let it compost while you fill the other side.